wanderlust ATLANTA: King & Queen For Sale? Known locally as the King & Queen Buildings—Concourse Corporate Center V & VI (respectively)—the Center went on the market in April of this year. I don't know the current status (keep an eye on your Atlanta Business Journal), but I can tell you a little about them otherwise. I moved to Atlanta the first time in 1987, so I got to see these two beauties go up. Construction was completed on the 32- and 33-story towers in 1988 and 1991 and they were as magnificent then as they are today. Located at the northeast quadrant of the Interstate 285 and Georgia 400 intersection, they're a promise of Atlanta's heaven-bound skyline for commuters coming in from outside the perimeter—or "OTP" as we locals call it. For non-locals, the "perimeter" is Interstate 285 which makes a full loop around Atlanta via the suburbs. 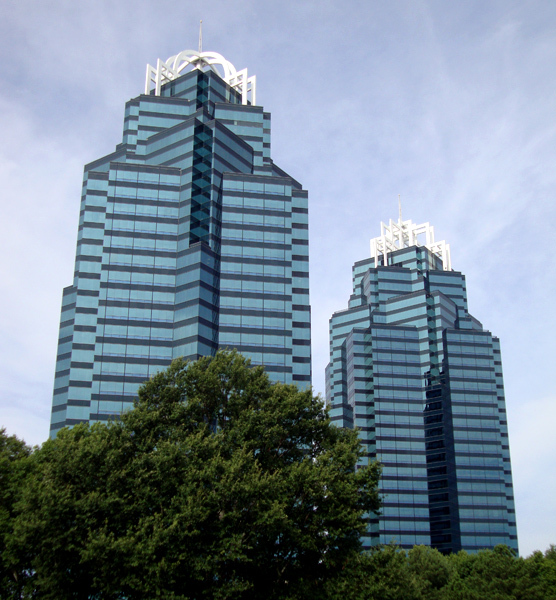 The King & Queen Buildings are among Atlanta's 20 tallest buildings, but they're actually in the city of Sandy Springs AND they're two of the tallest buildings in a suburban area in the entire United States. The Concourse at Landmark Center is a gorgeous complex...there's a lot more going on at the ground level than one might imagine. After being mesmerized with the towers' "crowns", you don't always think to wonder what's happening down below. 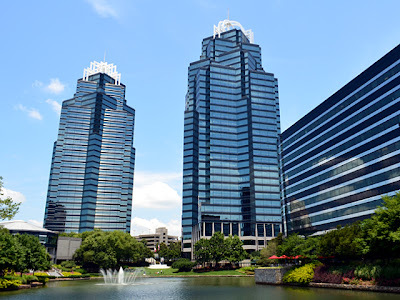 In the complex are offices, a four-star 371-room Westin Hotel, and a man-made lake complete with fountain and landscaped sitting areas where many of the tie-clad 9-5 tenants lunch. For most, just being given the opportunity to admire such beautiful architecture that far from downtown is a great treat in itself...but isn't it always better when it offers much more and it's maintained so beautifully? Yes?